Fizik, purveyor of my fave handlebar wrap, will soon introduce a line of handlebars and stems. 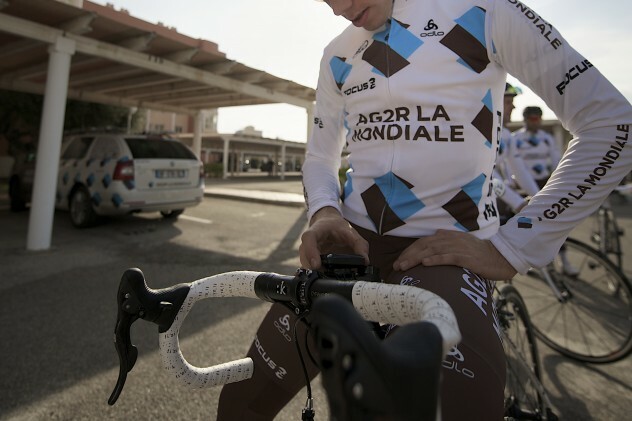 Currently French team AG2R is collaborating in the final stages of product development. Of particular interest to me is that the team is testing a “multitude of materials and shapes.” A “multitude of materials” is obviously aluminium and carbon, though the alloys or composite layups may obviously differ. However, a “multitude of shapes” must refer to handlebar styles. Since a World Tour pro team is directly involved in the development, I wonder what bar shapes will come from the partnership. Historically, pro riders often choose a fairly traditional dropbar shape, and in fact the team photos released by Fizk do show an AG2R rider with a fairly traditional, round bend as opposed to the “compact” bend style that is currently fashionable with consumers (or at least OEM suppliers). Honestly, I can’t imagine Fizik not submitting a compact bend bar shape, but I would be pleased as punch if they presented a more traditional, round bend alongside. In the images provided by Fizik, it appears that their bars share some similarities to Shimano’s “Pro Vibe” series of handlebars in having an oversize stem clamp section that stays 31.8mm far towards the shoulders of the bar, until finally tapering down to 24.0mm at the ramps. Continuing the broader cross-section further laterally enhances the stiffness of the handlebar, and some riders find the fatter cross-section more comfortable in the hands. It also looks like the Fizik bar may have a radius at the shoulder that is a little bit larger than the typical to give better forearm clearance when sprinting, though not as big of a radius as that of a track or “criterium” handlebar. Details of the stems are a little harder to discern. The example shown seems to have a typical 4-bolt, open-face closure, though the clamp seems a little narrower than typical. Like their seatposts, Fizik stems & bars seem to exemplify an elegantly simple if somewhat conservative graphic style, leaving their range of lushly coloured and textured handlebar wraps as an outlet for personal expression. I can personally hope that they offer a -17deg stem angle option in addition to the industry standard 6deg, but if Fizik sells a handlebar like the one pictured, then I can guarantee that you’ll see one on my bike.